+Morgan Freeman is well known as an American actor, film director, and narrator. 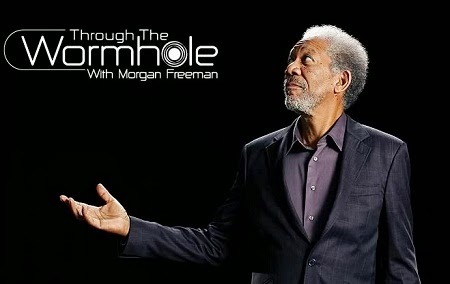 People know more about him and his voiceover talent when he is the host and narrator of the Discovery Channel television show Through the Wormhole, back in 2010. Fans would 'die' for the incredible Freeman's amazing voice, and a trend of Talk Like Morgan Freeman is really happening. 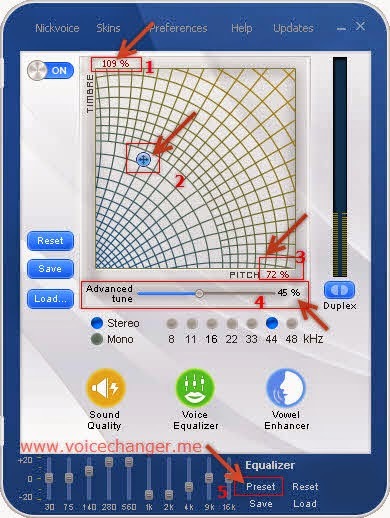 In this post, I will show you how to do Morgan Freeman with an assistance of a voice changer software - AV Voice Changer Software 8.0 Diamond. You need this sample audio clip for listening to it while adjusting the voice changing effects. If you cannot find one, use the below. Move the voice morpher's Pointer (2) on the Pitch-Timbre graph (also called the Morpher graph) to change the voice. **For easy moving the pointer and adjusting the voice, you can click on the pointer first then use the arrow keys from the keyboard to move it around. **Please also be noticed that moving the pointer up will give younger voice; move it left for male voice. Click on Preset (5) within the Equalizer panel and select Tender effect. 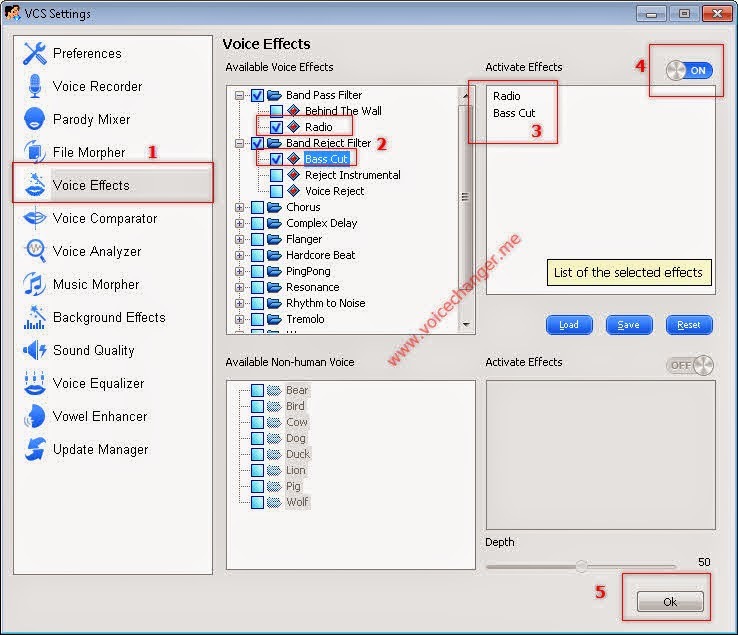 Open the Voice Effect (1) setting windows. Expand the Band Pass Filter and Band Reject Filter effect group (2). Check on these two following effects to activate them: Radio (Band Pass Filter) and Bass Cut (Band Reject Filter). As soon as the you check on the effects, they would appear on the Activate Effects panel (3). So, within this pannel, if you see unused effects beside those two, just remove them. 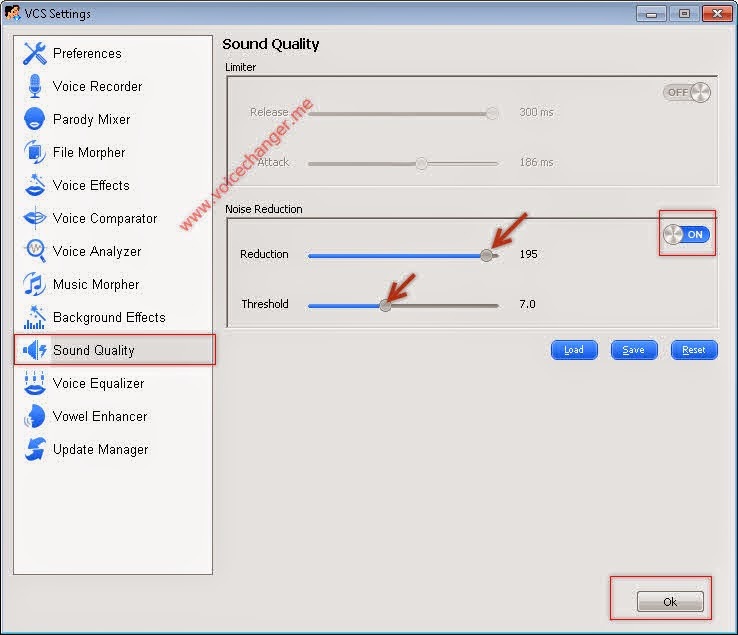 Hit Ok to save the settings and back to main voice changer GUI. Morgan Freeman revealed the secret of his amazing voice saying that "If you are looking to improve the sound your voice, yawn alot. It relaxes your throat muscles. It relaxes your vocal cords. The sooner it relaxes, the tone drops. 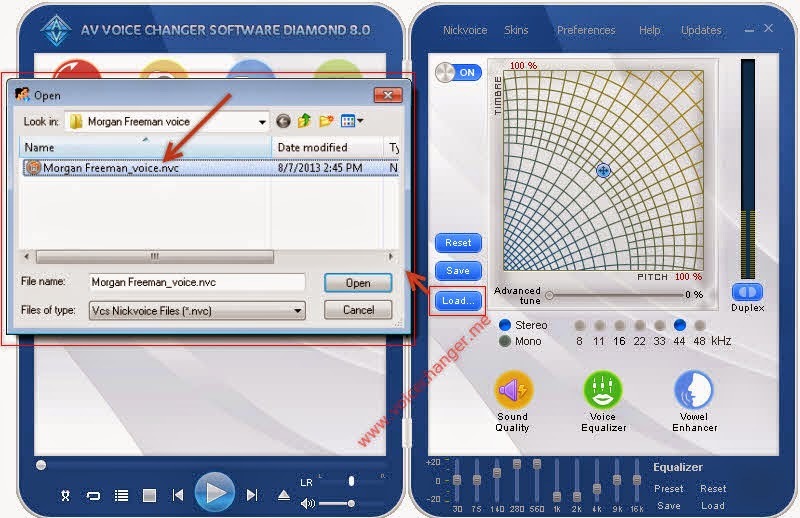 The lower your voice is, the better you sound "
So, make sure that you keep these words of his in mind, and practice your voice everyday along with the assistance of AV Voice Changer Software 8.0 Diamond. 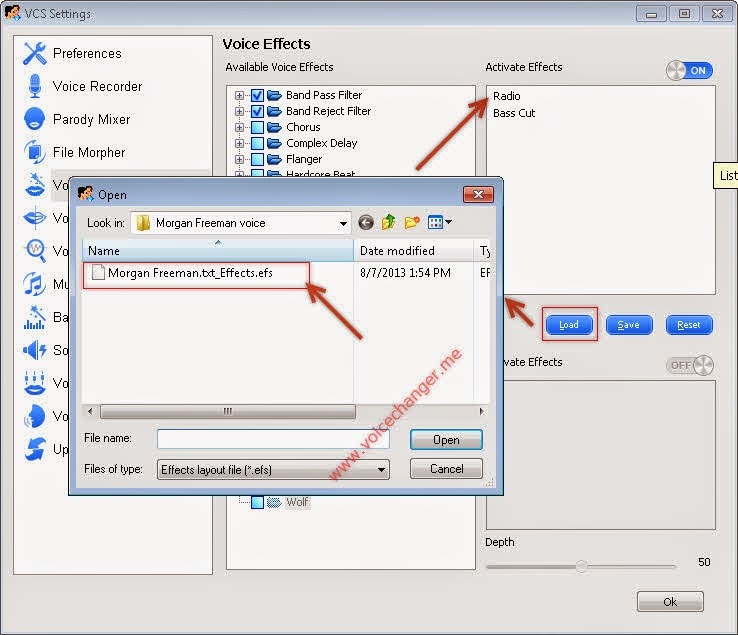 Download Moregan Freeman voice preset from here. AV Voice Changer Software 8.0 Diamond not only can be used in voice over and offline recording (e.g., do Morgan Freeman voice generator), but also can be used for changing your voice in real-time? 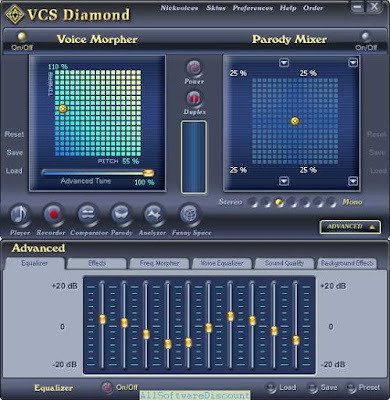 Buy Full version of the Morgan Freeman voice changing program (AV Voice Changer Software 8.0 Diamond) now!